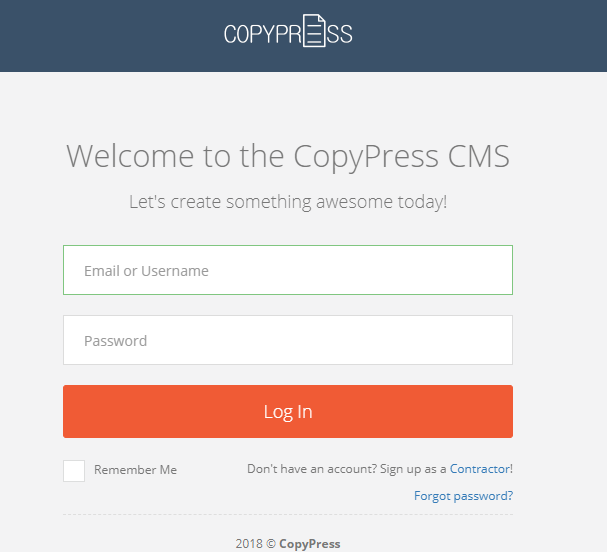 If you’ve been offered an assignment as a writer, then you’ll need to complete the project inside the CMS. Your project manager reviews and approves the article. Below is a rundown (start-to-finish) of how to complete a writing project. You will receive an email notification when you have a project offer open. If you’d like to accept or decline the offer, you ’ll need to log in. In the Task Invites tab, you will see all open offers. This is where you'll navigate to accept or decline the offer. C. Due Date: This shows you when you need to deliver the assignment by. D. Decline: Click this button if you do not want to take the assignment (you can see the expiration of the offer next to Decline, which indicates how long you have to make a decision before it is auto-declined). E. Accept: If you decide to accept the offer, click this button. Make sure you understand all requirements of the project before accepting. You will also receive an email that provides more specific details about the assignment such as the Assignment Brief and Assignment Directions. Once you accept an assignment, you’ll then be able to click on your Tasks dashboard to see more details about your tasks for each assignment. In the My Tasks section of your account, you will see tasks that are “Upcoming”, “In Progress”, “Submitted”, and “Completed.” All tasks marked as “In Progress” are ones that you need to complete. All tasks that are “Upcoming” are to be completed at a later date. You will receive email notifications when you have tasks that move from one status to the next. This action will open a new window which is your article assignment window and is where you will complete and submit your article assignment. 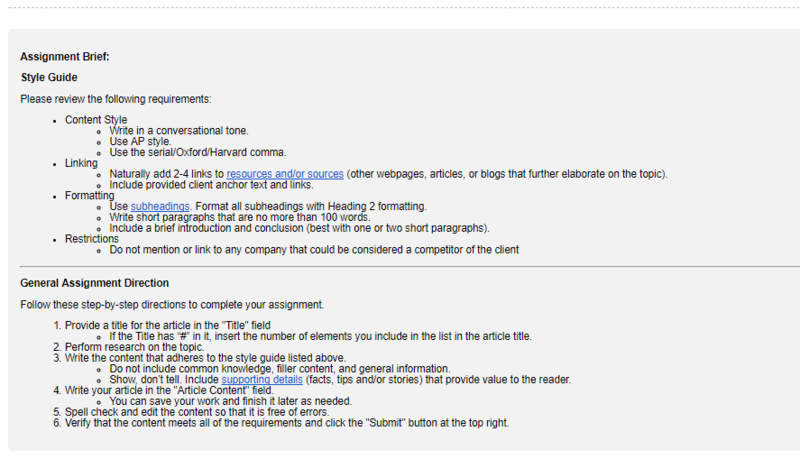 In your article assignment window, you’ll see a few important features. C. Assignment Brief: This is a very important widget!!! This is where you will find details about your specific assignment, including things like Word Count, Article Topic, Article Direction, Links to Add, Resources to Use, Pay Rate, and Due Date. Also in this panel, you will find details about the Style Guide and other important information that you will need to complete your assignment. D. Comments: This is the area of the page where you can leave comments about your submission, and ask questions to your project manager. It’s also where the editor and QA member can ask you questions or answer any questions you may have for them. This is where ALL communication about this specific assignment needs to be. After you have written the article to the specifications outlined in the Assignment Brief, you are ready to submit. In the top right corner, you’ll see the Submit Assignment button. If you have not hit your Word Count requirement, you will not be able to submit the article. 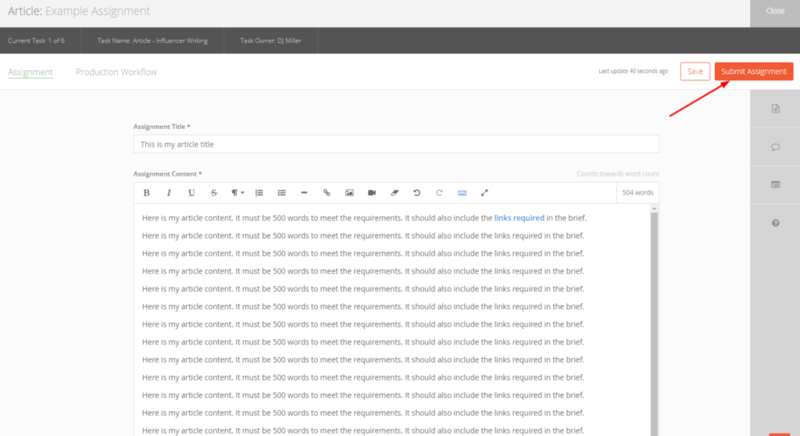 Ater you submit, an editor, QA member, and client will review your article. If they have revisions, they will send it back to you to revise. If they have minor edits, they’ll make those here. Once the article is finally approved, they’ll hit approve. 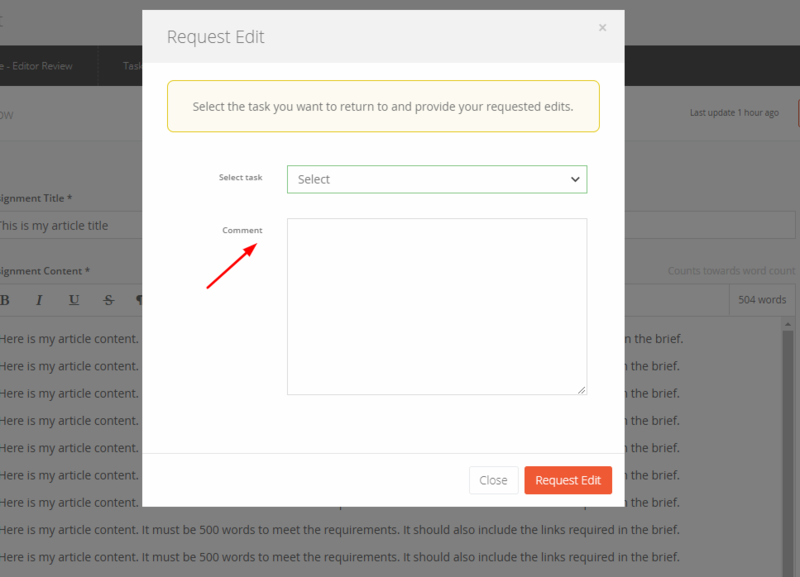 If they do request a revision, you will receive details about their edit request. After your assignment has gone through all series of revisions, your project manager will do one final review. If there are any issues with the article, then you will receive an edit request to make revisions before the assignment is complete. 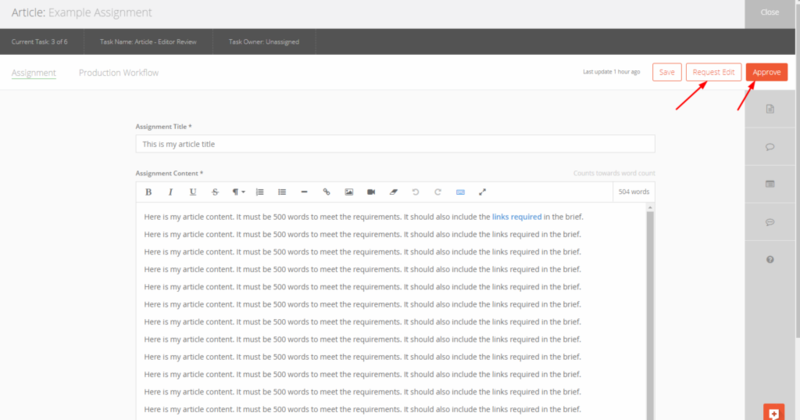 Once complete and approved, you’ll see the two tasks inside the Completed section of your My Tasks dashboard. Payment will commence within 90 days from the week you submit your assignment.